Here's a scan of a 1995 collector card printed in USA in 1995. In the early 1970s, the Norton-Villiers-Triumph group (NVT) ran into some serious financial problems. Thus its chairman, Dennis Poore, decided to launch a sporty ultra-lightweight to complete his range. That machine had to be cheap to run, as well as fun to ride, in order to attract young riders to the NVT line and later persuade them to buy its larger models. The overall concept was entrusted to Bob Trigg, one of the creators of the Norton Commando 750 and 850. The prototype made its debut at a press conference in London in July 1975. But that was the month that Britain’s socialist government refused to provide any further funding for NVT, which had already received $24 million in state aid. 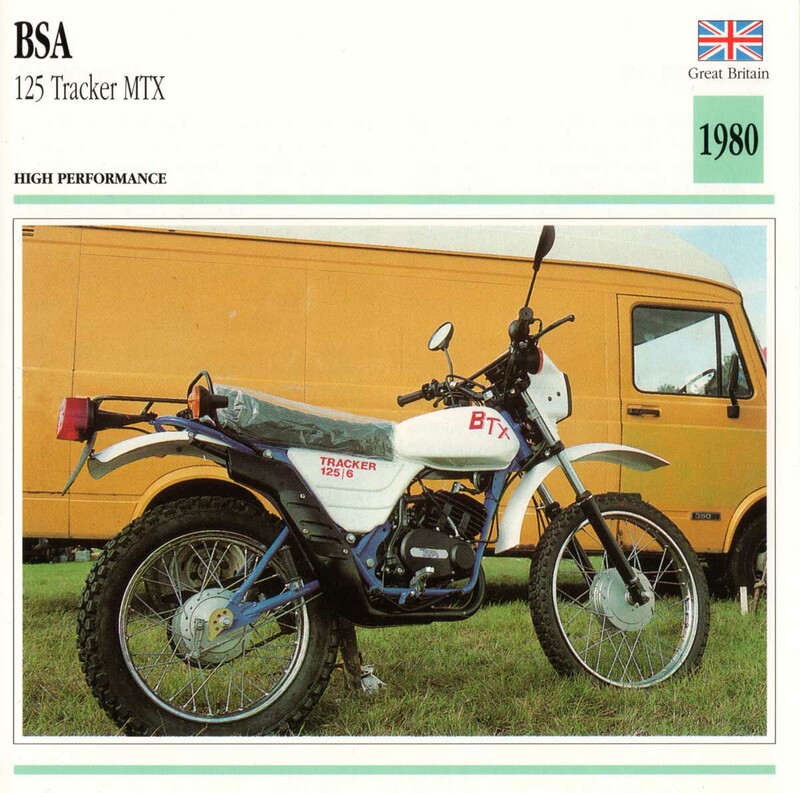 That first Tracker, powered by a 125 Suzuki single, received a lukewarm welcome from the British press. It was, however, very modem, with a double-cradle frame in small-diameter tubing and monoshock rear suspension. 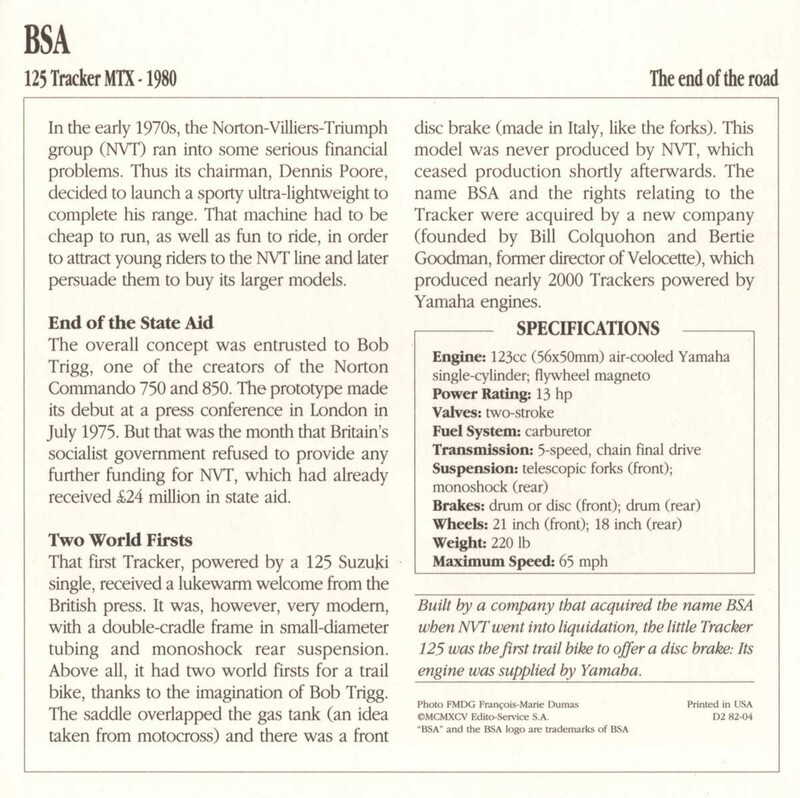 Above all, it had two world firsts for a trail bike, thanks to the imagination of Bob Trigg. The saddle overlapped the gas tank (an idea taken from motocross) and there was a front disc brake (made in Italy, like the forks). This model was never produced by NVT, which ceased production shortly afterwards. 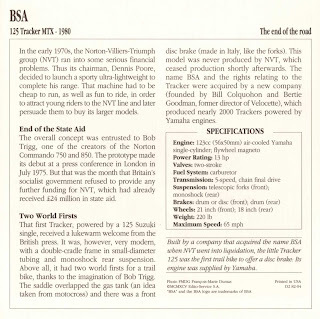 The name BSA and the rights relating to the Tracker were acquired by a new company (founded by Bill Colquohon and Bertie Goodman, former director of Velocette), which produced nearly 2000 Trackers powered by Yamaha engines. Built by a company that acquired the name BSA when NVT went into liquidation, the little Tracker 125 was the first trail hike to offer a disc brake: Its engine was supplied by Yamaha.